This week, there are celebrations around the world to commemorate the 200th birthday of Charles Dickens, one of the most notable authors in literary history. Most, if not all of Dickens’ novels are available on the Kindle for free. A Christmas Carol is probably the most well known Dickens masterpiece because it is often read at Christmas and is a popular play. It has also been adapted for film multiple times over the past 50 years. All of his other works have also have been adapted for theatre productions. I had to read Hard Times and Great Expectations in high school and college, but I never really got to know the background behind the writing. If I ever do decide to tackle them again, I want to explore the inspiration that contributed to the development of the characters. When you are in high school, reading classics always seems like such a chore. Dickens faced a lot of adversity in his younger years. His father spent time in prison because of debt. Dickens had to quit school and work in a shoe factory. 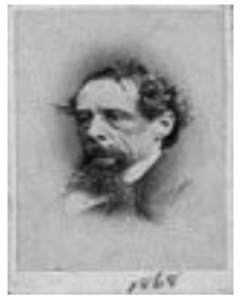 The hardships that Dickens experienced were manifested in his writing. Many of his characters are children who face some sort of obstacle. Think of Oliver Twist, who begged for more food and got reprimanded for asking. Food that was barely more than slop at that. There are so many important lessons woven through each story. Hard Times reveals a world based only on facts. Also notice the irony of the names in the book. The characters’ names are often the opposite of their personalities. Anything outside linear thinking is unaccepted. Ebenezer Scrooge gets visits from the supernatural who remind him the true meaning of Christmas and the spirit of giving. Charles Dickens made a profound effect on the literary world during his short life. He died of a stroke at the age of 58. Even if you hated his novels during school, you might find that you get a lot more out of them as an adult. Charles Dickens’ books, as well as many other classics, are all free on the Kindle and Kindle supported devices. Meanwhile, I need to go tackle A Tale of Two Cities and David Copperfield. Surprisingly enough, I never had to read them in school. It is always good to at least have some knowledge of the major classics because it is rare for literature to stand the test of time like his novels have.